Bellabox welcome the new year with their Chinese New Year Beauty Packet – a vibrant red box containing all the lovely beauty products, wrapped in a classic brown paper and topped with a slim red ribbon.. perfect for this festive season don’t you think?! Here are my goodies for the month of January! Caudalie Vinosource S.OS Morning Eye Rescue – This gentle eye cream hydrates, de-puffs and contains anti-oxidant rich grape Polyphenols to combat against premature wrinkles. I currently have at least 3 tubs of eye creams to go through but this will certainly come in handy for my next vacation! Laneige Snow BB Cushion – This 5-in-1 product definitely need no introduction if you’ve been reading my blog (Read here if you haven’t)! Eslor Introductory Collection – Treat yourself to a true-blue comprehensive and naturally based skincare treatment. Start by the Soothing Refining and Cleanser, followed by Replenishing Scrub. Refresh with the Comforting Mask before finishing off with a Soothing Cream. A complete course of comfort food for the skin this CNY holiday! Marc Anthony True Professional Conditioning Treatment – Give your daily hair cleansing routine a valuable boost with this weekly hair mask treatment. The Oil of Morocco Argan Oil Deep Hydrating Treatment promises to add moisture and smoothen your hair whilst repairing it. Home Secrets Shaping Smoothen (bonus item) – a drink that’s supposed to curb your hunger pangs the flavourful way with natural fruit pulps and juices from lemon. I gave this packet a go this morning to prevent myself from continuously snacking all the way ’til lunch.. it worked tho I am still not exactly a fan of the taste! 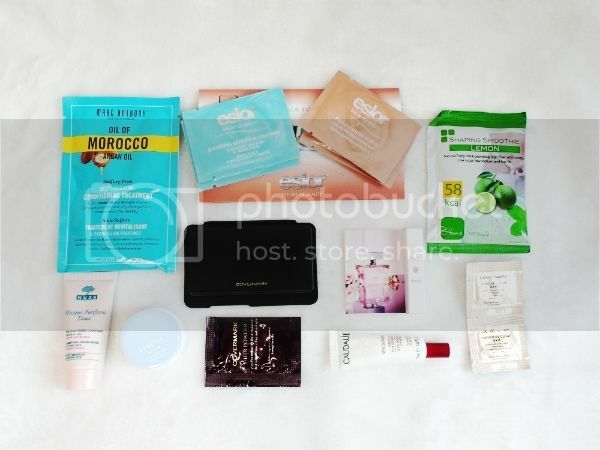 What’s in YOUR Bellabox CNY Beauty Packet? Share it with me!